Trumpeter Chris Pasin, born in Chicago in January of 1958, probably has been even more of an unknown than Chris Tedesco was. Tedesco, you may recall, was the subject of the fifth episode of these more-or-less weekly musings, and here we are a few months later with yet another hugely-talented-but-unknown trumpeter named Chris. About Tedesco, I said, “He is, simply put, the best jazz trumpet player you never heard of before.” Tedesco’s undeserved anonymity was achieved despite his having been extremely active in the music world. Pasin, on the other hand, built a name for himself in the 1980’s, working with the Buddy Rich Big Band, Lew Tabackin, Frank Wess, Victor Paz’s Latin Jazz Orchestra, and others. Then he turned and walked away from it all, preferring instead to pursue other interests while he raised his family. When he decided it was once again time to pick up the horn, he also threw open the doors to his private music vault and dug out a set of recordings from May of 1987. Those recordings were released by H2O records in 2009 as the album “Detour Ahead”, and it is that album that I’m going to discuss this time around. There are eight songs on this album, six of which are Pasin originals. We jump right in with the first song, “Lost And Found”, a beautiful piece of music. It opens with a bit of mellow, lyrical phrasing from the horns. Then pianist Green moves from the background and continues the wonderfully melodic ballad, all while Reid and Richmond both keep time and occasionally twist it as the pace slowly quickens. Then Pasin steps forward again, the big warm sound of his trumpet seemingly carrying you away. Before you know it, what began as a simple, quiet ballad has transformed into a white hot burn and you want to jump out of your chair and MOVE. Track three is another of Pasin’s, called “Jackhammer”. This lives up to its name and one jumps right from the start. The pace barely slackens . Since Pasin wrote this, we shouldn’t be too surprised that “Jackhammer” really allows the trumpeter a lot of room to shine. The piece also allows plenty of exposure for the other members of the group. Slagle and his sax take control first, followed by Green on the piano and then the whole group returns for the ending. The title track, “Detour Ahead”, is a quiet little tune that begins with Green and Reid. They are soon joined by Richmond and Pasin. “The Light At The End Of The Tunnel” opens with just Green on the piano and Richmond’s drums. They are quickly joined by Pasin and take us off on an interesting trip that includes what sounded to me like a faint middle-eastern flavor. Then the pace picks up and you realize it’s just good old bop after all. By the time we’re three minutes in, the quiet, soulful opening has been lost in the dust kicked up as they go into full swing. One after another the group takes their solos and the intensity gets almost mind-blowing at times. Then the pace and intensity both settle down, and as Reid takes a solo on the bass the song comes full circle, returning to the opening feel. At just under ten minutes, “The Light At The End Of The Tunnel” is the second-longest song on the album (being all of one second shorter than the longest song, “Island”). It is all over the map, emotionally. The Rogers & Hart piece “My Romance” is a nice, upbeat song that the group seems to really dig into and have fun with. One by one the guys take their solos, and each leaves you wondering what the next can do to top that. The album closes with “Island”, the afore-mentioned longest song on the disk. It opens with Slagle on the flute, quickly joined by the others, including Pasin’s once-more-muted trumpet. The flute is a nice change from the sax. Not that I have anything against the sax, but except for Ken Peplowski and a few others, you just don’t hear many flute players in jazz these days. The flute gives “Island” a light, airy sound, and when Pasin steps forward to once again reclaim the lead from Slagle, his muted horn is the perfect counterpoint to the flute. It’s a shame that events conspired to delay the release of this gem back in the late 1980’s when it was recorded. “Detour Ahead” is a fabulous collection of songs performed by an outstanding group of musicians. 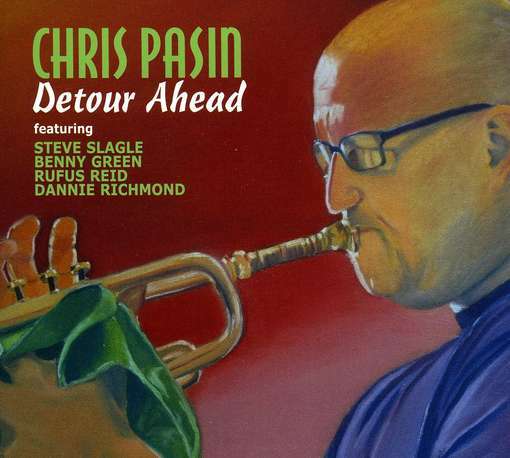 Whether you like fast, upbeat music or if you prefer slower, more thoughtful ballads, you’ll find that Chris Pasin’s “Detour Ahead” will make an excellent addition to your personal playlist for a Saturday, or any other, night! To learn more about Chris Pasin and his music, visit his web site. He also maintains a web presence on Facebook, and you can get another writer’s take on “Detour Ahead” on the allaboutjazz.comweb site.